There are a lot of “top” lists when it comes to parents visiting Las Vegas with kids. As a Las Vegas resident of thirty-five years, I’m happy to list some of the top spots for children off Las Vegas Boulevard. Located at 6601 North Buffalo Drive in Las Vegas, this is a Vegas parent’s dream. The park has an interactive water-play area, several playgrounds, a fenced dog park, multiple volleyball courts, two soccer fields, and a bountiful farmers’ market held here on a weekly basis. Right next to the park is the YMCA. This building features an indoor and outdoor swimming pool, two gymnasiums, a dance room, fitness center, and an adult wing. If you’re visiting the park then be prepared for a drive. It is about thirty minutes off of the Las Vegas Strip. And, if you are planning on heading for the park between 3 and 6 pm then prepare for gridlock. A lot of hotel employees live in this area and the drive can turn into an hour and a half parking lot between my noted hours of commute. Always fun for kids, this park is located on the east side of Vegas. The area can be rough, but parents from all over Las Vegas travel to it because of all the fun and excitement. And, it is a good way to wear the kids out for an early bedtime! 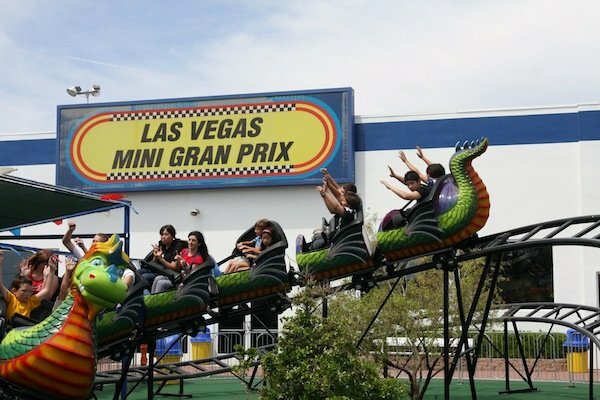 One really inexpensive option for Vegas visitors with kids, the Las Vegas Mini Gran Prix Family Fun Center is located about thirty minutes from Las Vegas Blvd. The pizza is good for kids but parents may want to stick with the salad bar. The facility has a dragon roller coaster that is perfect for little ones. They also have a regular racetrack for older kids and adults, as well as a separate and closely monitored kiddie track for toddlers. Don’t laugh! I’m serious, the entire family will love this. Even if you’re not a fan of Kiss, this mini-golf course is a blast! It is close to Vegas but not on The Strip. It is a street over on Paradise road, next to The Hard Rock Hotel. Weddings, kid parties, adult parties, everything happens here! And, you can walk over to The Hard Rock afterwards and get a family meal, on a family-friendly budget, at Pink Taco. About the Author: Helene Vece is a regular contributor to Vegaskids.info. Ms. Vece raised her two children in Las Vegas and takes her grandchildren for weekly Vegas adventures. Don’t miss her latest article: The Best Las Vegas Shows for Kids, Pre-Teens and Teens. I’d like to ask if you do not mind. I was curious to find out how you center yourself and clear your head prior to writing. I have had a difficult time clearing my thoughts in getting my ideas out. I do enjoy writing but it just seems like the first 10 to 15 minutes are generally wasted simply just trying to figure out how to begin. Any suggestions or tips? Appreciate it! Is it just me or does it look like some of the comments look as if they are coming from brain dead people? Early detection and treatment may be needed to protect against damage to the brain and other organs. looked. These new beds may also be used with a memory foam mattress to provide superior support for the hips, lower back, and shoulders. It is no longer sufficient to be a good player with your high school team. So practice being quick on your feet and get a few moves that will guarantee you fast breaks. use a full-court press is: How do you define success. understand this topic. You realize a whole lot its almost tough to argue with you (not that I personally would want to…HaHa).